Could this be what you get when you order an "Animal Style" shake? An In-N-Out customer named Fred Maldonado filed a lawsuit in Los Angeles Superior Court last week after allegedly finding meth in the milkshake he ordered at one of the chain’s drive-thrus. NBC LA details how the suit claims these events went down. On March 9, 2014, Maldonado went through a drive-thru at an In-N-Out in Downey. He ordered a burger and shake, which he then took to his motel room. He drank half his drink and went to sleep. In the morning, he emptied the rest of the shake into the sink. 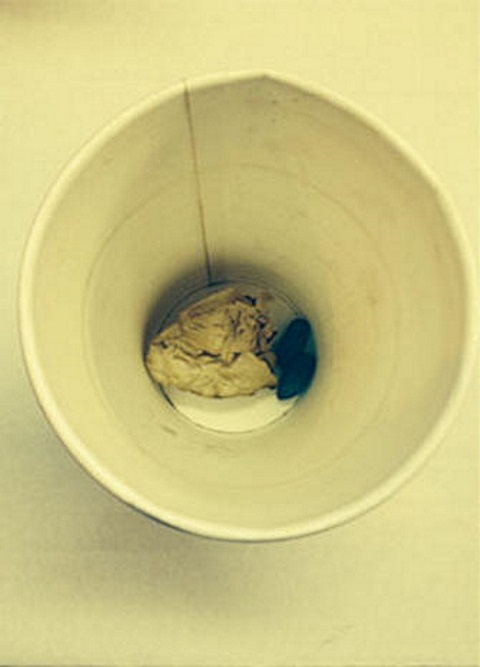 That’s when he claims to have found two blue gelatin caplets and a wadded-up napkin at the bottom of his cup. Maldonado then took the cup back to the In-N-Out location where he’d purchased it, and explained to the manager what went down. The manager offered him a free hamburger for his meth-related troubles. Maldonado’s lawyer, G. Patrick Connors III, said that later toxicology testing on those caplets revealed that they contained methamphetamine, but that neither the napkin nor the cup contained any traces of the drug. The lawyer also says that although Maldonado did not ingest those caplets, he suffered nausea, serious injuries to his health, and mental distress as direct results of consuming the drink. Looking at the photo of the cup, we have but one question: Did Maldonado drug himself, then dream up this elaborate lawsuit? We’ll leave that for the courts to decide.